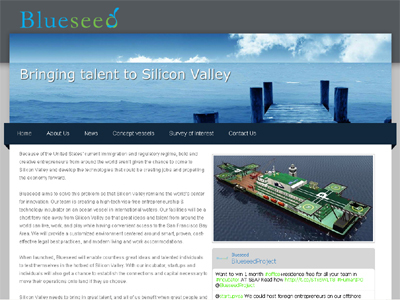 Blueseed aims to creatively solve the US work visa problem for Silicon Valley and allow professionals lacking a visa to legally work in close proximity to companies and investors from the Valley, by providing living and office accommodations on a barge anchored 12 miles offshore, in international waters outside the jurisdiction of the United States. The US work-based immigration system is old, slow and dysfunctionals. Foreign startup founders encounter huge difficulties and bureaucracy in obtaining a US visa. Legislation that would address this issue (the Startup Visa Act) is being ignored in Congress. Instead, new legislation is passed that forbids staffing companies from placing workers with 3rd parties, which is their core business. Blueseed will work around these problems and provide a business-friendly regulatory environment on a vessel 12 miles offshore, near Silicon Valley, but outside the jurisdiction of the United States.